She hides 'em and we seek 'em. We've spotted as many as seven adult praying mantids at a time in our little pollinator garden in Vacaville, Calif., but never once have we seen any of them laying eggs. 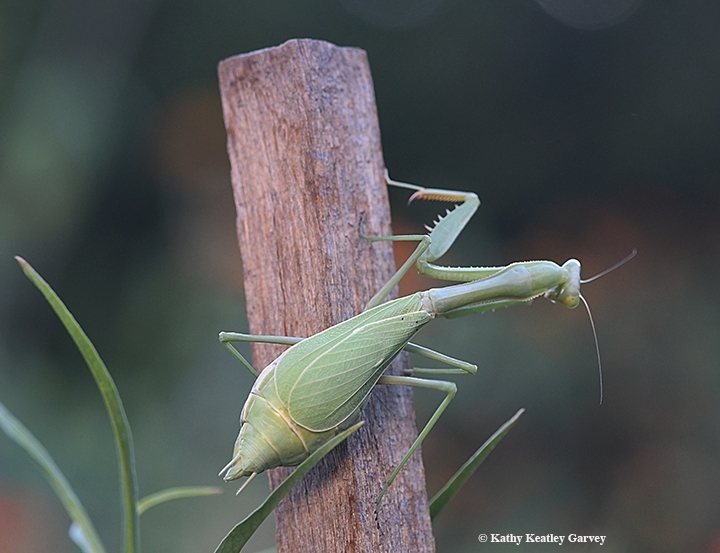 The praying mantis lays an egg mass known as an ootheca or a protective egg sac. But always when you're nowhere around! 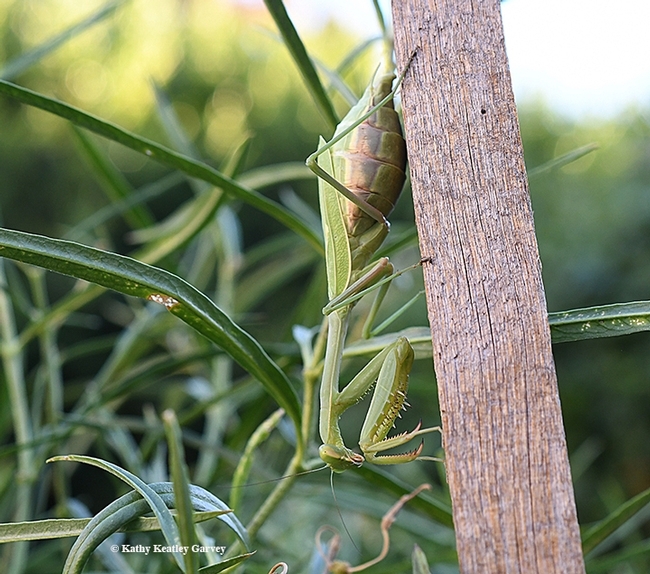 Late Sunday afternoon, Sept. 23, Ms. Mantis (a Stagmomantis limbata, as identified by UC Davis student Lohit Garikipati, a Bohart Museum of Entomology associate who rears mantids) decided to grace our milkweed planter with a little present. She climbed a redwood stake, looked around, saw me (oh, no problem, you're not a predator! ), and crawled over to the other side. She positioned herself upside down, bulging abdomen intact, and proceeded to do her business. A frothy cream-colored substance began to emerge. (See my short YouTube video.) When darkness fell, she was still there. When Monday dawned, she was still there, her ootheca finished and hardening. It probably contains several hundred eggs, but who's counting? However, scientists estimate that only one fifth will survive to adulthood. Many of the nymphs will be eaten by their hungry brothers and sisters. Bon appétit? "Now that she's deposited the ootheca, will she expire soon?" we asked Garikipati. "It's still early on in the season, so she may lay another two or three," he said. She may indeed. 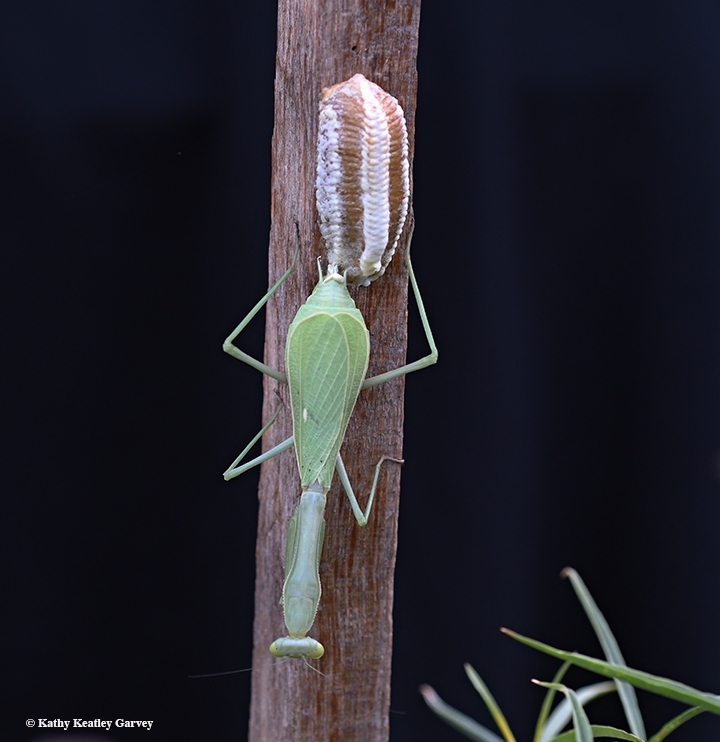 Mama Mantis continues to hang out in the milkweed, while her ootheca, like a flag on a flag pole, "commemorates" the spot. It should be a warning sign to incoming monarchs. 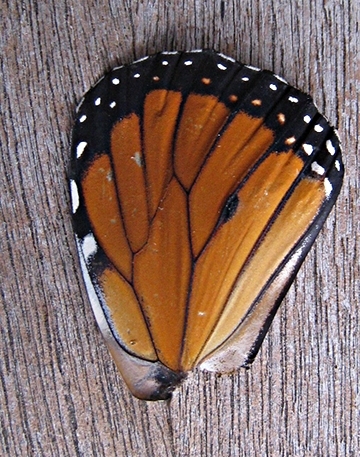 The next day, we found the clipped wing of a male monarch. Late summer 2018, we also watched this amazing event. 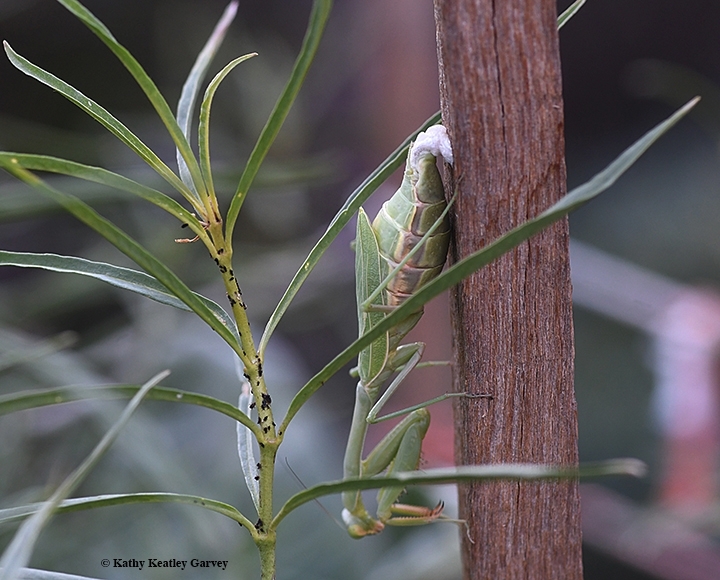 I knew there was an unusual creature staying in our row of milkweed on the south side of our Bettendorf, IA home, but had not given it much thought. Then one early evening, I noticed it making an "egg pod" on a steel post, supporting the milkweed plants. 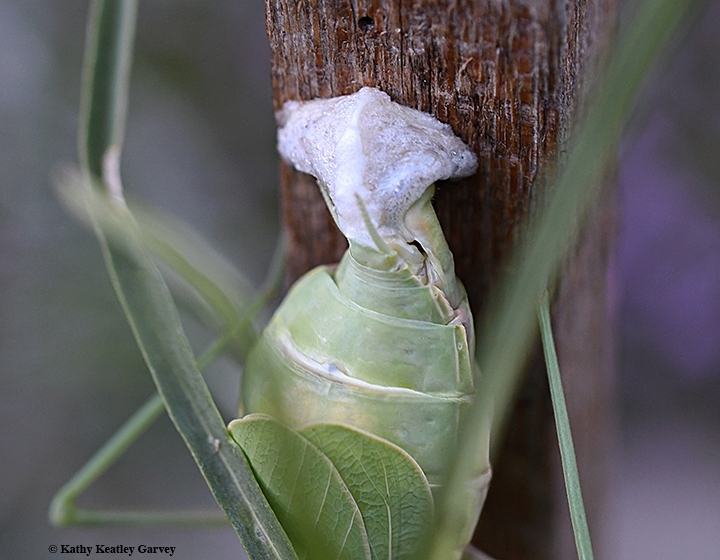 Since then, I have watched them mating, (once the male's head was gone), found a total of nine egg pods, fed them and held them. Last week, two moved to the front of our garage onto flowering begonias. Awesome! I hope you get many babies! Amazing photos! Would you be willing to share the technical details of how you captured them? For months, I've had the remains of an ootheca on my shelf, wondering "WTB?" Thanks for these images! !